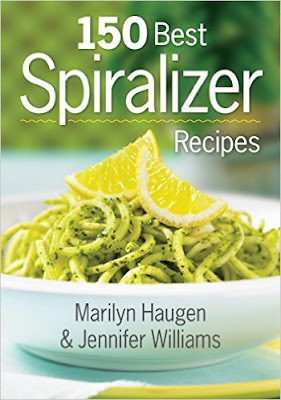 Spiralizers are pretty trendy these days, and not there are whole cookbooks devoted to them. I have to be honest and say that I was totally skeptical about zucchini "noodles" being as good as people said they were. I love pasta. I really do. I didn't think zucchini noodles could possibly make me happy. But I really loved this recipe. Okay, it's not the lightest recipe in the book since it's loaded with heavy cream and cheese, but it really does show of the potential of zucchini noodles. I didn't really miss the pasta. Okay, I'm not going to totally give up pasta now. 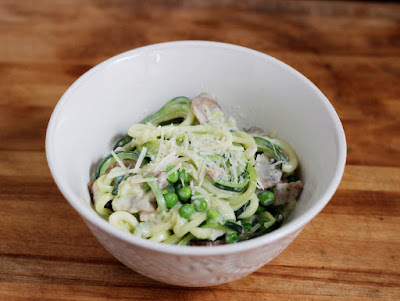 But I'm going to be making more zucchini noodle pasta recipes, particularly in summer, when there are so many zucchini that need to be used. Now, don't get me wrong. The book isn't all about zucchini noodles. 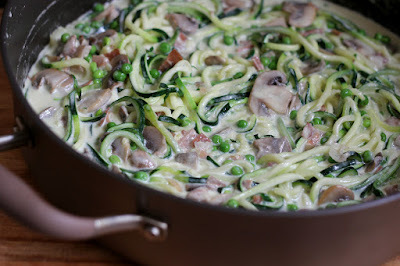 It's just that I thought this recipe was pretty great, and I wanted to keep it handy for myself, right here on the blog. There are recipes with spiralized carrots, onions, sweet potatoes, apples, kohlrabi, squash, and more. 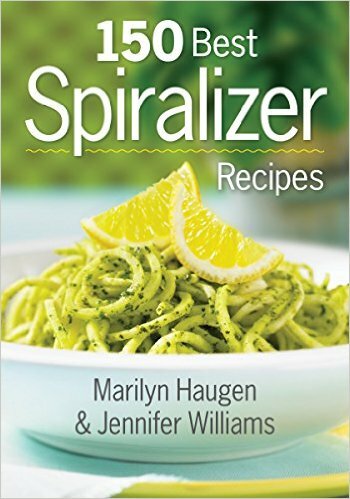 Using a spiralizer , cut the zucchini into thin strands. Set aside. In a large skillet, heat the oil on medium heat. Add the mushrooms and prosciutto. Cook, stirring, for 6-8 minutes until the mushrooms are softened and the prosciutto is slightly crisp. In a medium saucepan, bring the cream and butter to gentle boil over medium-high heat. reduce the heat and simmer, stirring, for 3-5 minutes or until the sauce begins to thicken. Whisk in 1/3 cup of the cheese and keep simmering and stirring until it's smooth. Remove it from the heat and add another 2 tablespoons of cheese along with salt, pepper, and nutmeg. Add the zucchini, peas, and cream sauce to the skillet with the mushrooms and prosciutto. Put the skillet on low heat and simmer, stirring, until the zucchini is cooked to your desired doneness. Serve the vegetable pasta garnished with additional cheese.